Pacific has been on an upward trajectory over the past decade. When comparing 2016 to 2007, the number of acquisition of residential development sites from overseas investors more than doubled, with volumes hitting more than US$42 billion last year. Although domestic buyers remain the majority group in all Asia-Pacific countries, the increasingly cross-border nature of development activity has been one of the most striking trends of the last few years. 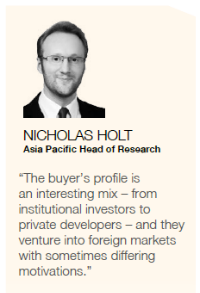 In this edition of Asia-Pacific Residential Review, we discuss the diversity of residential development land buyers across Asia-Pacific - analysing the most active developers, their origin, the most popular markets, the type of residential land and the most significant deals. We also provide a localised analysis of land deals done in the past five years in selected countries. When studying the drivers behind this trend, both pull and push factors are equally important. Evidently, the buyer’s profile is an interesting mix – from institutional investors to private developers – and they venture into foreign markets with sometimes differing motivations. In some markets, such as Singapore and Hong Kong, obtaining developable land for domestic players is increasingly a challenge due to limited land supply, strict financing rules, comprehensive cooling measures, slowing population growth and sometimes ironically, increasing competition from foreign buyers. Thus, many have taken the steps to manage their exposure to a tough domestic market by venturing abroad.